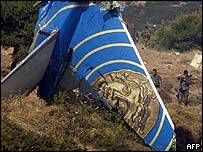 Aviation experts believe the Helios Airways plane that crashed in Greece, killing all 121 people on board, may have suffered a catastrophic loss of cabin pressure, exposing those on board to extreme cold and lack of oxygen. Aviation commentator Mark Welsh explains how modern aircraft regulate air pressure and temperature to allow safe flying. Modern commercial aircraft operate at altitudes which cannot sustain human life. To provide a comfortable environment, the cabin of the aircraft is sealed and the flow of air in and out of this "metal tube" is carefully controlled. The flow of air out is regulated by several valves in the body of the aircraft and the flow of air in is provided by compressed air taken from the engines. Breathing may become shallow as the person becomes weaker and the brain realises it is expelling too much carbon dioxide and creating a harmful imbalance of oxygen to CO2 in the body. They may lose consciousness. This air has its temperature and pressure corrected before being fed into the cabin. If the regulating valves fail or if the cabin structure is breached (by a failure of a door or window for example) then the pressure in the cabin would suddenly drop to match the outside air pressure. If there was a failure in the air supply system then the pressure would decrease more slowly but still eventually match the outside air pressure. If an aircraft flying at an altitude of 35,000 feet were to lose its pressurisation system completely, then the occupants would have 25-30 seconds to establish an alternative oxygen supply. If they were unable to do so they would die within two minutes. To combat this threat, aircraft have a warning system which alerts the crew if the cabin altitude is approaching dangerous levels. If this alert is received, the pilots should put on masks which will provide them with oxygen while they rapidly descend the aircraft to an altitude where the occupants can breathe without assistance. While this is happening, the passengers will be provided with oxygen from drop-down masks which will give them oxygen for 12 to 15 minutes, by which time the aircraft should be at a lower level. As well as air pressure, the aircraft's occupants must be protected from the deadly outside air temperature. If the warmed flow of air into the cabin were to fail, the temperature in the aircraft would decrease until it approached the outside air temperature of -45C to -60C. The emergency oxygen supply used by the pilots is independent of that used by the passengers. Any malfunction in this system would leave the pilots with very little time to recover the situation. If they were unable to do this, it is possible that the pilots would lose consciousness, the aircraft would continue on autopilot and the cabin crew and passengers would face a situation where they were running out of emergency oxygen and the air temperature in the cabin was rapidly dropping. The cabin crew would have portable oxygen supplies and a means of opening the locked cockpit door but would not be trained to fly the aircraft to a safe altitude. With the cabin air exhausted and the temperature dropping to -50C, the aircraft would fly until it ran out of fuel. The "black box" flight data recorder stores a huge amount of data gathered from sensors around the aircraft. This includes cabin pressure, the position of the flying controls and aircraft height and speed. There is also a cockpit voice recorder which will record noises, such as cockpit warnings, and conversations within the cockpit. Older voice recorder systems record sound onto a constantly running magnetic tape loop while newer systems use digital storage devices to hold much more voice data. In the event of a plane crash, depending on the model of the recorder and whether the data can be recovered, experts will be able to analyse cockpit voice recordings for either the last 30 minutes of the flight or for up to two hours before it crashed. 5. 1030: Greek ATC issues "Renegade alert"